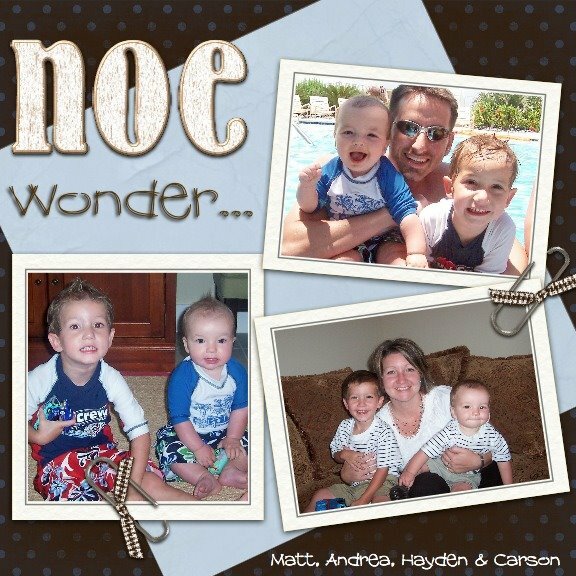 The Noe Family: Maybe I'm a tease! p.s Thanks for throwing me under the bus about the valentine story! Okay, you don't know me personally but, you probably read my blog hence the blog stalker comments. I am linked on Jeny's site. Anyway, if you are worried/wondering who reads your blog you should put a map stats thing on your blog. Go to http://mapstats.blogflux.com/ and put it on your blog. If you need help comment to me your email address and I will help you. Then you can see who and where your readers are coming from. Warning:it may freak you out when you see who all reads it. You could also put a counter on there to see how many page loads you have had if you feel like no one reads it. Matt may remember me as Todd Barnes' girlfriend in high school. Anyway, hope to meet you someday if you are ever in Edmond. I don't know if you remember me from ACU, but I knew Buster pretty well. I have checked your blog a few times from Summer's. I just started blogging a few months ago and I have loved coming across people I know... love the ACU connection. I know how you feel about comments... I see some people's blogs with 20 comments and I think WHAT?? No one loves me. But then my grandma emails me to tell me how much she loves my blog and I feel better. But really the reason I blog isn't for other people, but just so I can have some kindof memory of this time in our life. I've already forgotten so much about when my oldest was little. Anyway, you should put a stat counter on your site. I've been amazed at how many people who are reading mine... although I have no idea who they are. Maybe one day they will feel like saying hello. So, keep blogging. I bet someday your kids will love reading about when they were little. In the meantime, I'm sure there are lots of other people who enjoy it as well!